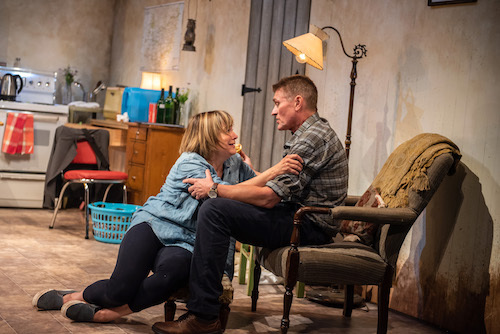 The Children is a new play by Lucy Kirkwood that has recently played both on Broadway and in London’s West End. The British playwright often takes a cerebral approach to her writing and tackles complex issues in her work. Canadian Stage previously produced her dazzling US-China political-thriller, Chimerica, in 2016. The set-up for The Children is promising: Hazel (Laurie Paton) and Robin (Geordie Johnson)—an older married couple, both retired nuclear engineers—have moved to a cabin in the English countryside to escape the fallout after a Chernobyl-style nuclear meltdown at the power facility where they both worked. A former co-worker, Rose (Fiona Reid), shows up unannounced with an interesting proposition for her former colleagues that will force them to make a tough decision. There’s an obvious allegory between the nuclear fallout and climate change and The Children seems like an opportunity for a millennial playwright to take her boomer characters to task for ruining the economy and destroying the environment for their children. Unfortunately, I thought Kirkwood’s attempts to deal with these bigger, complex issues and tackle the question of personal responsibility were only half-hearted. The show gets off to a very slow start. It’s essentially a living room play where old friends and former co-workers, who haven’t seen each other in decades, exchange pleasantries and catch up on the minutiae of their lives. There’s a love triangle that adds a superficial layer of complexity to the relationship between the three protagonists but it isn’t until about two thirds of the way through that the central conflict is even introduced. Ironically (or perhaps rather fittingly) it is the childless Rose who acts as the moral compass and implores her former colleagues (who have multiple children and grandchildren) to make the necessary sacrifices to do the right thing and fix the mistakes of their past. Hazel expresses no remorse and is unwilling to give up her blissfully ignorant, idyllic life in the country while Robin wavers somewhere in between the two women’s positions. Unfortunately, I never got that compelling debate. This isn’t an “issues” play or an intellectual play and the characters don’t grapple with big ideas in a meaningful way. I also didn’t find the characters interesting enough to exist in their own right. They seemed to me like the sort of stock characters a playwright creates to represent certain ideas or to argue certain points of view. However, in The Children, I don’t think those concepts are fully formed enough nor do I think the debate is rigorous enough and so we’re just left with the machinations of the personal lives of three uninteresting characters. Ultimately, Kirkwood is neither sympathetic to her boomer characters nor is she sufficiently critical of them. I wanted a no holds-barred cage match but what I got was some half-hearted cajoling. It’s such a missed opportunity. Frankly, I left The Children unsatisfied and wondering what the point of the whole thing was. Shows run Tuesday to Thursday, and Saturday at 8:00 p.m., Friday at 7:00 p.m., Wednesday at 1:00 p.m., and Saturday and Sunday at 2:00 p.m.